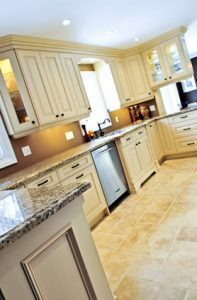 While doing a kitchen remodel with Honey Do Homes, we offer custom cabinets as well as cabinet refinishing and cabinet restoration. Custom kitchen cabinets and custom bathroom cabinets are among some of the finest in Wichita. We would love to be your next cabinet contractor. Call Honey Do Homes.